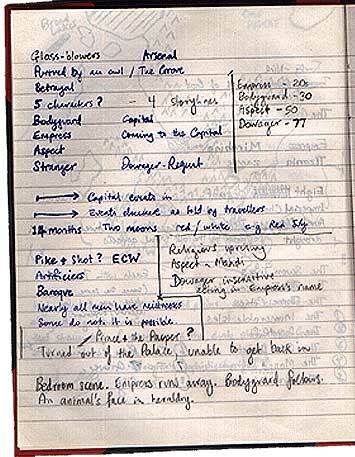 This is a brief overview of how I go about writing a book, which may well be quite different from many other writers and different to how you like to work yourself. However, in amongst the cries of "how could he work like that!" there may be some useful pieces of information to help with your own writing. To me, there are really four stages to writing a book, though they do overlap each other, swap places at times or even take over for far longer than they should. These stages are: thinking, planning, writing and revising. Most of my books seem to stem from a single image or thought that lodges in my brain and slowly grows into something that needs to be expressed. That thought may be a "what if?" or perhaps just an image. Sabriel largely began from a photograph I saw of Hadrian's Wall, which had a green lawn in front of it and snow on the hills behind it. Many other thoughts, conscious or otherwise, grew out, upon and over that single image, both before and during the writing of the book. At this stage, I merely put down bullet points or mnemonics that will remind me of what I was thinking. This can be very useful later on, particularly if the gestation period for a book is several years. For all my longer works (i.e the novels) I write chapter outlines so I can have the pleasure of departing from them later on. Actually, while I always do depart from them, writing a chapter outline is a great discipline for thinking out the story and it also provides a road map or central skeleton you can come back to if you get lost. I often write the prologue or initial chapter first to get the impetus for the story going and then write the outline. Usually, I have to write a revised chapter outline two or three times in the course of writing the whole book, but once again it does focus the mind on where the story is going and where you want it to go. 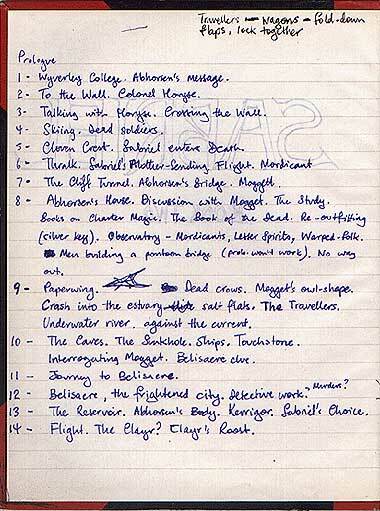 Here's an example of the very first chapter outline for Sabriel. For those who've read the book, you can see it is very different. Then there is the second chapter outline, which I wrote about a third of the way through, which is closer to the end product. Short stories, articles and items on my website I type straight into the computer (mostly a Macintosh, though I also use a PC) in Microsoft Word. However, I write the novels longhand first. Nowadays I use a Waterman fountain pen (for Shade's Children and Lirael), though I used felt-tips earlier. The advantages of writing longhand are several, at least for me. First of all, I write in relatively small handbound notebooks which are much more transportable than any sort of computer, particularly since you can take them away for several weeks without having to consider power supplies, batteries or printing out. Parts of Sabriel, for example, were written on a trip through the Middle East. Parts of Shade's Children and Sabriel were written at the beach. The other major advantage is that when I type up a chapter from my notebook, I rewrite as I type, so the first print-out is actually a second draft. Sometimes I change it quite a lot, sometimes not so much, but it gives me a distinctive and separate stage where I can revise. At the typing stage, I cleaned up the writing a bit and it had further minor revisions later, but in this case at least, it stayed much the same. Aboved on the right is the typed page of the manuscript, as it went to the publisher. Which brings me to revising. As I said, when I type the handwritten words, I am also carrying out my first major stage of revision. However, I usually have to go through at least two revision stages after that. The first of these is when I first print out the typed chapter. I go through it and make changes in pen, which I will take in later. The second stage (and sometimes a third time as well) occurs when the entire manuscript is finished for the first time. I leave that big, beautiful pile of print-out on the shelf for a few weeks, then sit down and read the whole thing, making corrections as I go. Finally, I bundle the ms. off to my Australian and U.S. publishers and wait for their reaction(s), which generally will include some suggestions for revision and occasionally a request for rewriting. Sometimes these will be good, worthwhile changes and I take them in. Sometimes they are not, and I argue about them and -- unless I can be convinced otherwise -- refuse to alter the text. Basically, I try and keep an open mind, since there is nearly always room for improvement. I'm often asked by would-be writers how I can write a full-length novel which takes a year or more to get done. My stock answer is that I never sit down and think "I have to write a novel today". I sit down and think "I have to write a chapter", or "revise a chapter" or "finish the chapter". That way, it's only ever 2,500-5,000 words that are the immediate goal. As a further motivational gimmick, I always use the word count utility when I've finished typing a chapter, and write that down, with a running total of words and the date in the front of my first notebook for the current work (each novel takes between five and six of those red and black numbers). I also write down the music I've been listening to as I write and anything else that might be interesting to look back upon. Like the fact that I uploaded my first homepage on April 19, 1996! Here's the word count summary from Shade's Children. (which is about 20,000 words shorter than Sabriel and 35,000 shorter than Lirael). 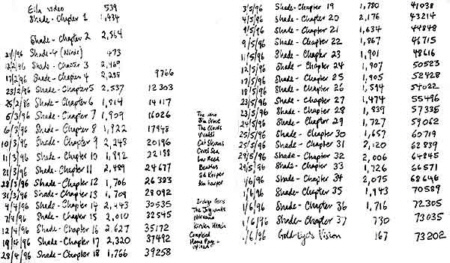 The word count is a relatively small thing, but it has an amazing psychological effect, particularly as more and more chapters appear and the word total grows. I find it very encouraging, particularly in the first third of the book, which always seems to take me half the time. Here are several one liners which sum up my writing philosophy. Some I've made up and some are probably paraphrases of other people's sayings, only I can't remember who said them. "You can't write if you don't read." surprised by your own finished novel." "Writing anything is better than not writing something perfect." "Read, write, revise, submit, repeat." "Never believe the first twenty publishers who reject your work. For the twenty-first, submit something new." actually write to be a writer." 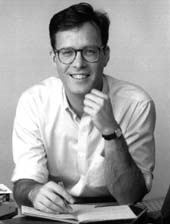 ** Award-winning Young Adult and Children's author Garth Nix was born in Australia. His first published book was The Ragwitch, a young adult fantasy published by Forge in 1995, which was followed by Sabriel and Shade's Children (HarperCollins). Shade's Children was short listed for the 1997 Aurealis Awards, is an ALA Best Book for Young Adults, an ABA Pick of the Lists, a CBCA Notable Book, and was short-listed for numerous other awards. 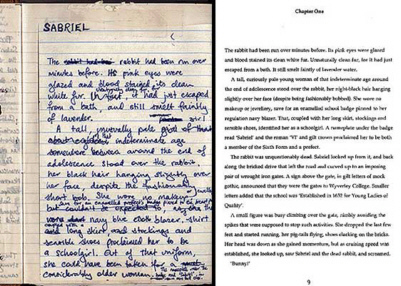 Sabriel won both the Best Fantasy Novel and Best Young Adult Novel in the 1995 Aurealis Awards. It is also an American Library Association (ALA) Notable Book, an ALA Best Book for Young Adults, a CBCA Notable Book, a LOCUS magazine Recommended Fantasy novel, and was short-listed for numerous U.S. awards, as well. Garth's latest book is Lirael (HarperCollins), which is set in the same world as Sabriel, but 20 years later. 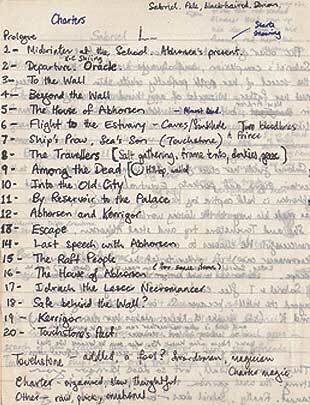 It is the first half of a story that will be continued in Abhorsen. HarperCollins has created a site for Lireal, His books are known for their humor, wit, depth of character and imagination. He is also the author of the bestselling children's fantasy series for Scholastic and LucasFilm called The Seventh Tower. Book Four, Aenir, has just been released. Garth now lives in Coogee, Australia, five minutes walk from the beach, with his partner Anna, a book editor. His recreational interests include fishing, bodysurfing, collecting books of all kinds, reading, films, writing and lunch. He also maintains a popular website which gives more information about his books.